Santa is on his way to our homes. All white hairs, a snow white beard, red trousers and jacket with trim as pure white as can be and in large black boots. Bringing love, joy and of course presents to all the children of the world who had kept clean, been good, kind, but most of all who had loved and cared for everyone around them. I believe the excitement is same for you and for all around the world. 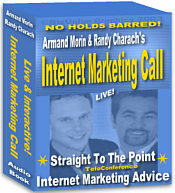 SPOTLIGHT ON: "Internet Mkg Call"
Important: This -2 Hour 23 minutes Audio Training Course- Should answer ALL your questions on bringing your website to the Top League! Let the very ordinary title do now deceive you! Well, unlike so many other 'information products" out there, this is free-flowing discussion with nothing held back. The information is current, original, honest and useful to you right now. It truly can help you take your business to the next level. More over, you DO NOT have to read a thing! Just listen to the seminar for two solid hours. And at the end of it, you will be armed with a powerful perceptive to make your online business a success! Writing for the web is different than writing for print. People read differently on the web. They scan text looking to pick out information rather than read your article word-for-word. 1. Start with your conclusion. This is called the "inverted pyramid" writing style. Most people will only read the first paragraph of an article anyway. Most web articles are 600-800 words. Keep the most important information "above the scroll" since most readers do not read to the end of the article. 3. Use headings, subheadings and highlighted keywords to make your text easy to scan. 4. Keep the article to a specific topic. Cut any sentence that doesn't directly relate to your point. Develop one idea per paragraph. 5. Limit anecdotes and examples to one per topic. 6. Use lists and bullet points. Help the reader find the information they are looking for. Links to other sites and source material increases your credibility. articles shorter if you provide external links to background information. 8. Don't rely on adjectives and adverbs for punch. Say "dashed" rather than "ran very quickly" or "finish" for "successfully complete". Remembering the way your readers use the web will help you write effectively and will get your articles noticed! Complete Internet business including audio, ad-tracking, hosting and more for a monthly cost you won't believe! Just visit: http://www.1securehost.com. Also, feel free to republish this article in your own e-zine or web site. These 4 Products showed a distinct up-ward sales trend from the last month. The user-satisfaction-rating is very high for all these 4 products for the sheer value they provide. 1. Simple Site Maker - FREE: A real easy-to-use HTML Editor that will help you create your HTML pages without having to be a techie; a computer guru or a geek. Just keep typing, choose the functions you want by pointing your mouse and craft your web page easily. If you are absolute beginner, this is for you. 2. Fast HTML Editor - FREE: This is slightly advanced. With DHE Editor it's possible to draw and generate dynamic WEB pages (HTML, ASP, PHP, CFM, JSP) without the need to write a single line of HTML code.It functions very similar to a paint program; choose a tool on the left bar and draw with your mouse! Creates pages visible on Internet Explorer, Netscape, Opera, etc... in about 10 seconds of work! Well. That sums up the last fortnight of November. Do not Forget To Rate 'HomeBiz-Tips'. Your valuable vote helps us to improve this E-Mag as well as allow us to keep it Ad-Free.